Suneden Specialist School uses an integrated model of education whereby the Speech Pathologist and Occupational Therapist guide best practice through providing ongoing professional support and opinion relating to individual students’ therapy needs as they occur throughout the school day. This consultative model allows Suneden to provide a multi-disciplinary education with Allied Health therapies firmly integrated throughout all aspects of learning. 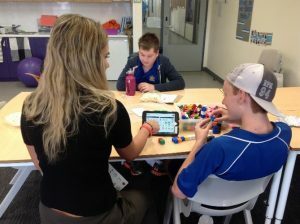 Our Speech Pathologist acts in the role as our Communication Specialist with a focus on supporting the teachers and classroom staff to incorporate and use the student’s communication systems across the school setting. Just as we “talk” with our voices throughout the day, the student’s communication occurs throughout the day in a variety of settings. Our Communication Specialist has a strong passion in the support of various communication systems (e.g PODD, core vocabulary boards), communication applications for use with iPad devices (e.g. Proloquo2go, Avaz, Compass PODD) as well as specific speech generating devices. She also facilitates the safe and enjoyable mealtimes for our students with complex mealtime needs. In addition to providing classroom support, our Communication Specialist liaises with families about their student’s communication needs as well as with the student’s private speech therapy providers to ensure consistency of ideas across home and the classroom. Our Occupational Therapists (OT) works in close consultation with all staff to address whole school, class, bus and student specific participation needs. Occupational Therapy supports are practical and diverse and they evolve each term to meet the changing needs of the students and classes. As well as staff coaching and school-wide supports, our Occupational Therapist is instrumental in leading staff in the development of Positive Behaviour Support Plans. These plans aim to unpack the underlying reasons for a students actions, including understanding and supporting emotional & sensory processing abilities. Our Occupational Therapist integrates learning about “Energy States” into classroom practice so students can develop their ability to recognize, and manage, their emotions and body-energy states. Additionally, she is involved with students in a range of other OT areas including play, social interactions, independence, self-care, fine motor, toileting, mealtimes and equipment adaption. 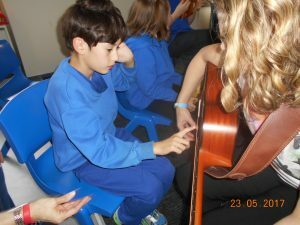 In 2018 Suneden engaged the services of a trained Music Therapist (part-time) to engage the students through the medium of music. The inclusion, participation and engagement of the students in this art form has been heart-warming and joyous to see. Our Music Therapist is also building staff capacity and knowledge in this area, so that the benefits of the therapy are continued throughout the week. With under 15 registered Music Therapists in the whole of Adelaide, we are fortunate to have secured this specialized therapy for our students.